The banjo is a great beginner's instrument, since it can be played with simple finger picking at first. This can progress to more advanced styles the more you learn and practice. Five-string banjos are mostly associated with bluegrass, country and folk music styles, producing an unmistakably rich, twangy sound. Make sure your banjo is properly tuned. You can purchase a banjo tuner from a local music store or find one online. Make sure the tone of your banjo strings matches the tuner before playing. An open "G" tuning is used for most country and bluegrass music. 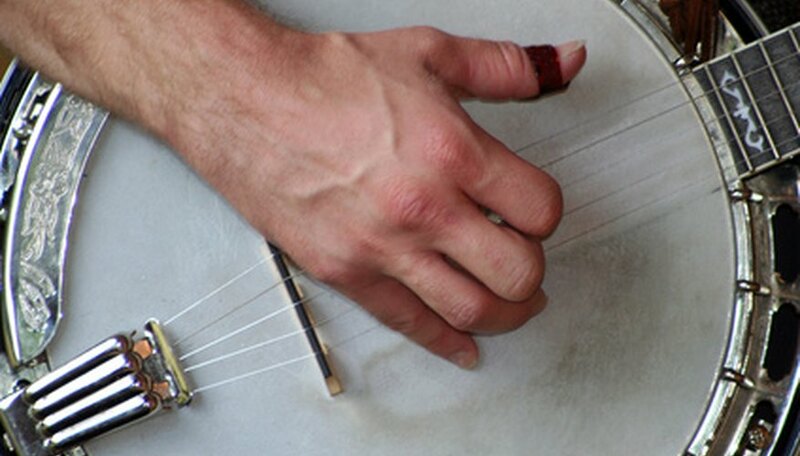 Rest the banjo on your lap, so you can strum with the hand that you write with. Position the thumb and finger picks on your strumming hand comfortably. Refer to banjo tablature to begin playing. Tablatures are diagrams that show the banjo frets and where to place your fingers. They are a good way to begin and are particularly helpful if you cannot read music. Begin to learn chords and "rolls." Once you are used to the way your fingers move while playing, you can start to learn these elements. "Rolls" are repetitive patterns of finger picking. Most country songs use only a few chords, so once you learn them, you will be able to play a variety of songs. Put together the chords and rolls you have learned by using sheet music or by improvising your own combinations. Learning basic music theory can enhance your playing and your appreciation for the banjo and help you to learn more about the instrument and its mechanics.